On Wednesday, 20 September Prime Minister Dr the Right Honourable Keith Mitchell met with the Secretary General of the Organisation of American States (OAS), Luis Almagro, who was accompanied by Political Advisor Paul Spencer. Among the issues discussed was the ongoing devastation wreaked by recent hurricanes on a number of islands in the Caribbean region, most recently the Commonwealth of Dominica, the United States Virgin Islands and Puerto Rico. Both the Prime Minister and Secretary General expressed their solidarity and support to the governments and peoples of all the affected islands and outlined different initiatives at each of their levels, which are been undertaken to assist in relief efforts. Dr Mitchell made another urgent plea for organisations like the OAS to use their clout to advocate for the need for larger countries like the United States, to address the issue of climate change, which experts have said, is the main reason for the dramatic increase in the level of hurricanes that the region is currently experiencing. Dr Mitchell also used the opportunity to emphasise a common position among CARICOM leaders, that there is a serious need to reconsider the criteria used to graduate countries from low to middle income when considering them for aid and concessionary financing. According to the Grenadian leader, while he has no problem with the concept of aid organisations and more advanced countries helping those who need it the most, there are other factors such as a country’s vulnerability to natural and external shocks, which must be considered in the criteria. The Secretary General for his part, shared similar concerns about climate change and its obvious effects, and promised that the OAS will issue a new message with regards to Climate Change and the need to urgently address. Another highly important matter discussed is the ongoing political situation and tension in Venezuela between the government and the opposition parties. The Prime Minister expressed the Caribbean Community’s position, and outlined their offer of good offices to the government and opposition forces in Venezuela to help mediate the dispute so that peace and order can be restored to the people of Venezuela. Amalgro expressed his understanding of the prime minister’s and his colleagues’ position and explained that the OAS is desirous of achieving the same end as CARICOM, which is a peaceful resolution of the conflict so that order is restored to the benefit of the Venezuelan people. He cited that the OAS is very concerned about the restoration of democracy in Venezuela and their efforts have always been geared toward getting the feuding political factions to understand that without a general respect for the rule of law and democracy, there would be sanctions imposed on them globally. The Secretary General pledged support to CARICOM in moving forward with its offer of Good Offices to mediate the Venezuela crisis. The discussion concluded with expressions of a shared and fundamental understanding between the Prime Minister and the Secretary General of the desired goal and what is needed in order to assist in that regard. 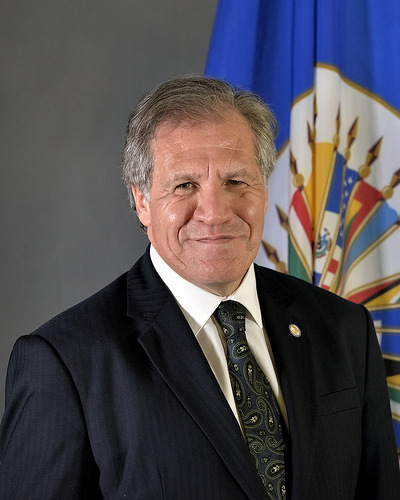 The meeting concluded with Secretary General Almagro inviting the Prime Minister to address the OAS next month in Washington DC, on the issue of climate change and the need to urgently address.